The Thursday Interview: Sanna Hines. Today, I'd like to welcome Sanna Hines, author of “Shining Ones” to The Thursday Interview. Before we get started, a quick intro! Sanna Hines is fascinated with the question, “What IF?” What if I were in danger? Would I face it with bravery and resourcefulness—or give in to fear? What if I had wings? Or lived in a town where creatures outnumbered humans? What lies waiting to be discovered behind the veil of ordinary existence? Journalism, art history and business studies led Sanna to a career in marketing communications. In 2004, she turned to fiction. Her first two books were published in 2015. She holds a master's degree in art history and two black belts in Tae Kwon Do. Sanna and her family live near Chicago. I would, and my characters have. In Shining Ones, characters break speed laws, pass borders without going through customs and immigration, break into private buildings, and remove an item from a museum display. In Stealth Moves, my first book, characters invade a home to rescue captives. Of course, the villainous characters do much worse (kidnap, assault, theft, manslaughter) to save the ones they love. Having hope. Knowing your purpose. Feeling high self-worth. As long as you believe your life has meaning, you can enjoy the passage of time—“the lovely ride” as James Taylor said. Breathing. I can’t remember a time when I didn’t write. Just as some people sing or draw without thinking, I write—even if just in my head—all the time. Life seeks life. People may dream of unconditional love, mini-me clones, or a second-chance at childhood, but they’re being driven by biology. Parents do get wonderful things from their offspring, though not in the ways they imagine before the children arrive. 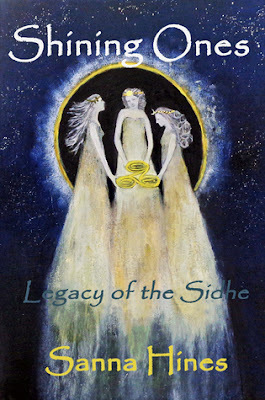 No.5 What was the biggest challenge in creating your book, Shining Ones: Legacy of the Sidhe ? Learning about ancient Irish mythic history. In Ireland, the lines between history and myth blur. Until World War II, Irish school children were taught their history began with the Mythological Cycle, the tales that form the basis of Shining Ones. These stories were transmitted from elder to youth for at least 700 generations—more than two millennia—before being set down in writing by Irish monks. Imagine if the Christian Bible had been transmitted this way. How much would have been lost? How much added? There are many interpretation of the stories. Whom to trust. If you surround yourself with people who appreciate you, life is satisfying and good. People who tear you down should not be allowed to define you or to limit your life. No.7 How did you come up with the title Shining Ones: Legacy of the Sidhe ? 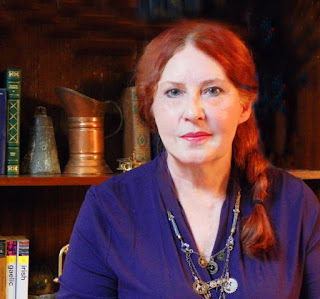 My modern characters are descendants of the ever-living, specially gifted Tuatha dé Danann (Clan of Danu). The TDD were a Bronze Age people who ruled Ireland until their defeat by incoming Iron Age Celts. To survive among the newcomers, they retreated to the hill country, where they became known as the Daoine Sidhe (people of the hills). Over time, this description was shortened to Sidhe, but not everyone felt comfortable naming them. Just as characters in the Harry Potter series call Voldemort “You-Know-Who", "He-Who-Must-Not-Be-Named", or "the Dark Lord,” the Irish referred to these powerful beings as “Shining Ones”, “Gentry” or “Fair Folk”. Fair folk, of course, is a synonym for fairy. I listen to people I respect; lose patience with those I don’t. I had a friend who voiced opinions on every topic. When I asked how she formed those opinions, she said, “People will think I’m stupid if I don’t say something.” A lot of people fall into that trap. They’ll enjoy it. Characters, both heroes and villains, are intriguing and fully formed, including some we know from history. Dialogue is natural. The plot moves through a fascinating landscape of ancient and modern places in Ireland, Wales, England, Scotland and the Isle of Man. There’s adventure, suspense and love. Kirkus Reviews called it, “An entertaining, well-crafted story with unusually complex and entrancing characters.” I like that description. Scientists tell us we live in the sweet spot between beginning and ending of the Universe. This is the time when life can exist. Better make the most of it! Cop-shapeshifter Tessa Holly won’t ever grow old. Descended from Ireland’s fairy race, the Tuatha dé Danann (Clan of Danu), she’ll enjoy long life and spectacular abilities. This legacy comes with a price: Her life will never be her own. Tessa’s Clan will choose her friends, career and husband. But when her brother and a human girl fall prey to enemy Formorians bent on stealing Danann longevity, the Clan goes silent. To rescue the captives, Tessa must rely on a man no one trusts as her guide through cairns, castles and cathedrals in search of her people’s greatest treasures. Along the way, she discovers a power greater than any she’s known. If she uses it during the final, crucial battle with Formorians, will she save—or destroy—her people? Enjoyed the interview - it was nice to get some insights and interesting background here. Thank you for sharing.